Yesterday, Mary offered me a ride up to Evanston for banding, but I decided to forgo the offer. Instead, I took the purple line ‘el because it allowed me time on the VanBuren platform, by far the best monitoring perch for the MCC nest this year. I left home at 7:45am, figuring that would leave plenty of time to get to Evanston by 9am. Riiiight. Maybe the purple line has only been allotted two trains or something, but it took a good half hour for a train to show up – silver lining, though, plenty of time to monitor the MCC without risking getting kicked off the platform! While I didn’t see any chicks, I did hear them. Over the traffic noise below, I could distinctly hear chick cheeps from the nest and noted at least one of the adults in the area at all times. Good! I finally got on the train at 8:20am and boy, was that ride up to Evanston slow. The CTA is currently doing major renovations to some of the stations and the construction delays were pretty severe. The delays did allow me to get a nice long look at both the Broadway and Uptown nesting locations, where I got to see both pairs cruising around above the nesting sites. By the time I got off the train, it was already 9:10am and I had to really hustle to the library, where the banding was already in progress. As prearranged, I set up below the nest instead of going inside to help with the actual banding. My task – make extra, extra sure the male’s band read 48/M instead of 49/M. I saw a ladder leading up to the nest already in place and felt certain that Mary, et al, had been out to get the chicks before I got there. Both parents seemed very agitated. 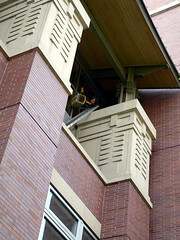 The male, Squawker, stood tensely on the nesting ledge, peering into the library windows. 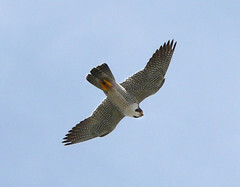 A piercing screech overhead directed my attention to the female, who was swooping back and forth in the airspace above. So, yes, the babies were probably already inside the library. 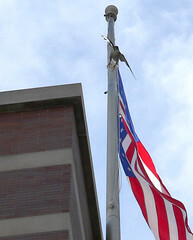 Suddenly, Squawker let out a loud screech and jumped from the ledge to join his mate in the sky. To my surprise, I saw Mary emerge and climb the ladder. So they hadn’t already started! When she got to the top, she turned and started hauling a small pet carrier up on a rope. She looked down, saw me, grinned and waved. I gave her a thumbs up before returning my attention to the adults in the sky. One shot I’m dying to get is a good flight shot and I saw this as my best opportunity to do so, since both birds were flying down low. The Evanston nest is only up two stories, so I knew the adults would continue to come pretty close to the ground on their fly-bys. I set my camera on burst mode, settled on my back on a nearby bench and aimed at the sky. Ready. It is in this sort of instance that one becomes keenly aware of just how fast a peregrine can fly, especially when really pissed off. An adult would swoop in and by the time I’d depressed the shutter button, it would already be gone again. In the 250 some odd shots I took, 240 of them were of the blank sky, the side of the building or tree branches. The shot to the right and the one above are the only two really usable shots I got, and both are less than ideal. Ah well. If nothing else, I have even more respect for people who have clean, beautiful in-flight shots of these guys. Squawker did me a great favor during all this commotion, however, by landing briefly on the nest ledge. I got a good look at his bands and confirmed 48/M. Eggzellent. Many library patrons stopped to talk to me. I suppose with my scope out on its tripod, my Field Museum id dangling around my neck and the camera, I looked like someone who might know what was going on with the birds. 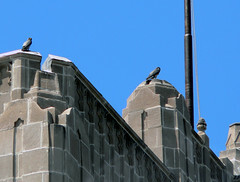 I got a chance to chat with about ten different people, all of whom were excited to hear about the peregrines on the library. 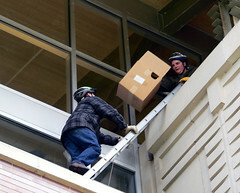 I heard noise on the ledge and saw Mary and Matt come back out to return the chicks to the nest. Matt gave a little wave as he went back down the ladder. As soon as the humans and ladder were gone, both parents landed and boy, what a ruckus – the chicks were yelling, the parents were yelling – everyone was all upset. After a bit, Mary came out of the front entrance, so I started gathering my things together. Matt and Joel (another vet tech from the zoo) followed her, talking to a tall gentlemen dressed in a very cool raptor t-shirt. I joined with the group and we gabbed a bit. Apparently, the banding had gone very well. There were three males and one female. As usual, the library had gone above and beyond in the naming arena. They named the female “Zipporah”, for the wife of Moses, because her name in Hebrew means “little bird”. They named the males “Baker” (for John Alec Baker an obscure British librarian who wrote a memorable book of nature writing titled Peregrine), “Horus” (for the Egyptian deity usually represented as a falcon or a falcon headed man) and “Boccaccio” (for Giovanni Boccaccio, the author of The Decameron, which contains a memorable story about a falcon). Matt introduced the tall gentlemen as Given Harper, Professor and Chair of the Department of Biology at Illinois Wesleyan. Dr. Harper had a camera and he and I chatted about wildlife photography as the rest of the crew put the banding gear in the cars. I was very happy to learn that the delightful Dr. Harper would be going to lunch with Mary, Matt and I. Our normal pub wasn’t open yet, so we ambled around the corner to another restaurant with outside seating. I learned that Dr. Harper had driven all the way up from Bloomington that morning, just for this banding. He planned to turn around and drive back after lunch. Now that’s dedication! 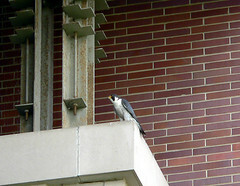 After a wonderful lunch (the company was superb, the food pretty good), we stood on the sidewalk watching the library falcons alternately guard their babies from the roof of a building across the street from the nest or streak around the sky. It would probably take them the rest of the day to fully calm. Dr. Harper shook all of our hands as he prepared to leave. His reaction really touched us all. My very good friend Jay, a brilliant man who holds a PhD in 18th-Century British Literature from the University of Chicago, went on a rant awhile ago regarding the use of the word “awesome” in modern American culture. He said that it vexed him that such a powerful word, one that should convey a state of overwhelming admiration or feelings of powerful reverence, should be used to describe nachos, sports cars or movies. He went on to say that trivial things should not be described as “awesome”, that is unless a person is actually thrown into a state of wide-eyed, slack-jawed wonder at the sight of their ninety-nine cent burger. ~ by Steph on June 8, 2007.